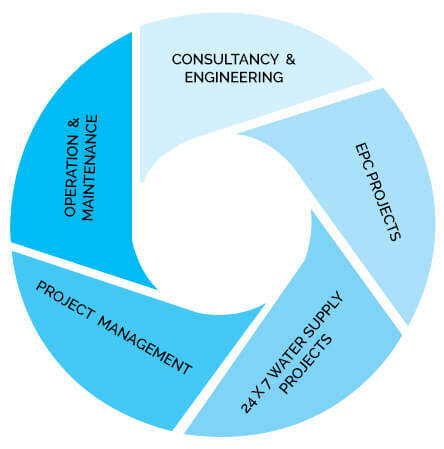 Sauber Environmental Solutions Pvt Ltd. is a technology based EPC (Engineering, Procurement & Construction), project management & Consultancy organization in the field of water and wastewater management & providing services ranging from initial project conceptualization, planning, techno-economic feasibility studies, Design, Engineering, cost estimations, preparation of tender documents, tender evaluation & consultancy to full fledge EPC (Engineering, Procurement, Construction), Erection, Testing & Commissioning, Operation & project management on Turnkey basis. Sauber Environmental Solutions is a Leading Water and Waste Water Treatment Company in India and Wastewater Treatment Service Provider in India. We offer sustainable and uniquely integrated eco-friendly, low cost treatment solutions for water & municipal wastewater treatment, industrial effluent treatment, Biogas generation and recycle, recycle & reuse of treated wastewater/effluent. SESPL has in – house design & engineering capabilities and offering value engineering services for both project design and construction. We offer leading edge technology and our team is having long term experience in water and wastewater management field.